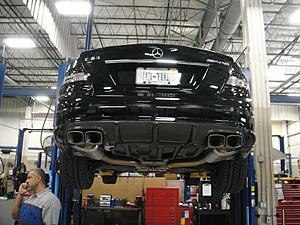 I just go my car back from Renntech...They installed their Ecu Stage 2 tune and the Akrapovic Exhaust (Evolution). 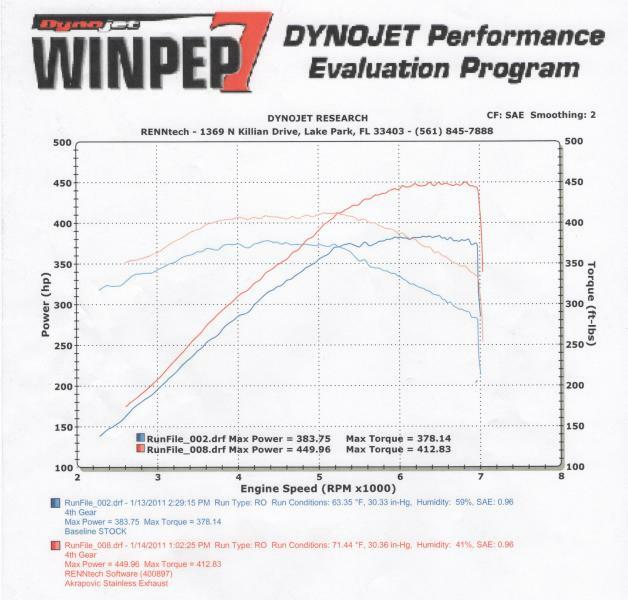 Just thought I'd share with you guys the dyno results. The car felt great on the way back from the dealership. That's pretty much all I can say about it right now since I was only in it for about 15 minutes. Please let me know if you have any questions. P.S. I'll try to put some pics up tomorrow! Those are some really nice results. Exhaust work consist of headers? What kind price? Looking good! Can you have them send you all of the runfiles? I'd love to see all eight (or more) runs. Congrats, welcome to the Akra club... gains look right where they should be, I love how on the RENNtech tunes you pick up power throughout the whole power band not just on the top end. So did you happen to catch the RENNtech airbox group buy I linked to in the other thread? Last edited by MB_Forever; 01-15-2011 at 12:15 PM. Congrats! Great results. I need a tune too! If only I can get a similar tune in Singapore. Glad to hear you are pleased with the results. We look forward to future mods and continued improvements on your 63. Thanks for the kudos. Haha you were definitely right! ... And yep I got in on the group buy... It should be coming in about 2-3 weeks. Thanks you again! Yea looking forward to the airbox and possibly doing the wide-body kit! Great results. You have gotten the absolute top notch parts for your car. According to [email protected] in another thread, the Evolution system doesn't include headers. Those are great numbers for tune and exhaust. Wow, nice to see RENNtech is a sponsor here! Even as a lurker I noticed how much irresponsible posting has gone on about RENNtech lately, mostly from other vendors or ex employees. I'm glad to see you on here as well to straighten out the misinformation. Probably because they're shortys. If you're going to do headers why waste the time? Not sure if you are referring to headers only or headers + tune. In terms of headers + tune, I've seen the shorty headers make power on 3 different black series, one CLS63, and an E63 And those are only the ones I know about... I'm sure there are plenty others. 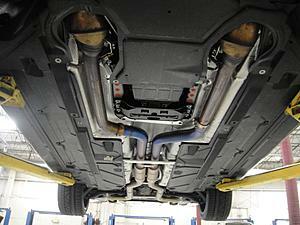 I do agree, however, that they do not make as much power as their long-tube headers. Also, despite the fact that short-style headers make less power, I'm pretty sure RENNtech created them specifically for those of us who are looking for as much hp gain as possible without having to deal with smog issues. 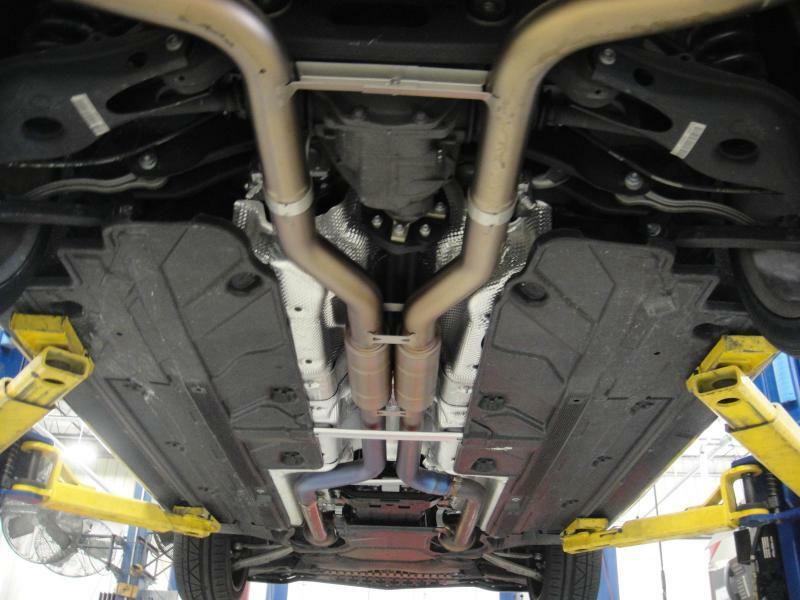 Plus, it offers a simple bolt-on design that is easy to put-on and take-off without messing with the rest of the exhaust system. To the OP: where are the pictures and videos we were promised? Last edited by MB_Forever; 01-18-2011 at 03:08 PM. I'd like to see how much power the Renntech shorties make in comparison to the PLM exhaust manifolds that Superlubricity tested. But then again, we need to start another thread on that subject matter. Are the Akra mufflers baffled? Thanks for clarifying it up! Sorry about the delay on pics... semester just started so things are pretty hectic at the moment... I'll have the pics+video up soon ... Also I'm in the Miami area if anyone wants to see/hear the exhaust in person... Just let me know! 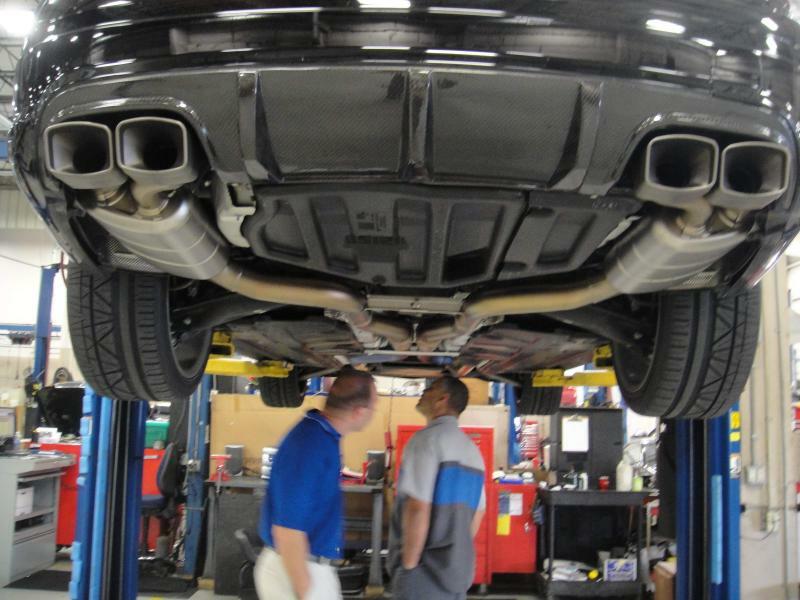 Here are some quick pics of the exhaust... Video coming soon with pics of the car... Again sorry about the wait! dude.. your akra is awesome!!! 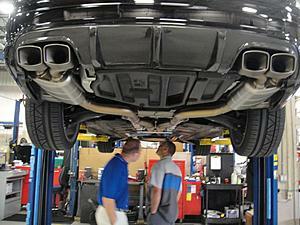 is your exhaust for sale ? ?